Santa Ana Police Detectives arrested Erick Alvarez Hernandez, a 27 year-old resident of Santa Ana, for a sexual assault that occurred on Saturday, January 5, 2019 in the 1000 block of West MacArthur. The assault was captured on surveillance video from an OCTA bus. This case received extensive media attention and detectives have followed up on numerous tips from the public, since the night of the attack. On the night of the assault, Hernandez went to the Buffalo Wild Wings at 3800 south Bristol, just blocks from where the attack occurred. Hernandez was asked to leave the restaurant for his belligerent behavior. Evidence from the restaurant helped lead to Hernandez’ identity. 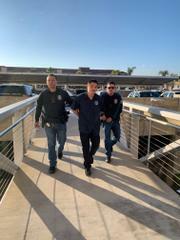 Detectives conducted hours of surveillance and arrested Hernandez at his workplace in the city of Irvine. 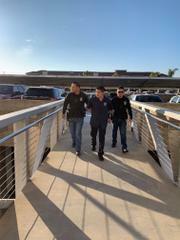 Santa Ana Police detectives stopped Hernandez’ vehicle as he left work and took him into custody. 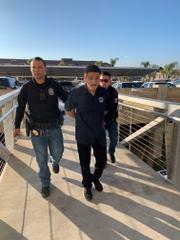 Hernandez was charged with multiple sexual assault charges including kidnapping and booked at the Orange County Jail. His bail was set at $1,000,000.00. Santa Ana Police Detectives are investigating a sexual assault that occurred in the 1000 block of West MacArthur, on Saturday, January 5, 2019, at about 8:30 p.m. The suspect sexually assaulted a woman in her 50’s, who was waiting at a bus stop. The violent attack occurred on the sidewalk as numerous motorists drove by. The suspect, described as a Hispanic male, was wearing a Dallas Cowboys #82 jersey. An OCTA bus arrived at the stop, and the suspect fled the area. Video surveillance from the bus captured the suspect running eastbound from the area. Santa Ana Police Department Detectives are advising the public of this attack as the suspect has not been identified and is not in custody. Detectives are asking for anyone with information to contact Detective Gerry Corona at 714-245-8343, Gcorona@santa-ana.org or Orange County Crime Stoppers at 1-855-TIP-OCCS.